346 pages | 49 B/W Illus. 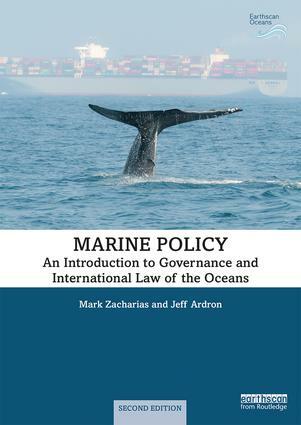 This textbook provides readers with a foundation in policy development and analysis, describing how policy, including legal mechanisms, are applied to the marine environment. It presents a systematic treatment of all aspects of marine policy, including climate change, energy, environmental protection, fisheries, mining and transportation. The health of marine environments worldwide is steadily declining, and these trends have been widely reported. Marine Policy summarises the importance of the ocean governance nexus, discussing current and anticipated challenges facing marine ecosystems, human activities, and efforts to address these threats. This new, fully revised edition has been updated throughout, including content to reflect the recent advances in ocean management and international law. Chapters on shipping, energy/mining and integrated approaches to ocean management have been significantly reworked, plus completely new chapters on the United Nations Convention on the Law of the Sea, and the impacts of climate change have been added. Pedagogical features for students are included throughout. Aligned with current course offerings, this textbook is an ideal introduction for undergraduates and graduate students taking marine affairs, science and policy courses. Mark Zacharias is the Deputy Minister of the Ministry of Environment and Climate Change Strategy with the Province of British Columbia, Canada. He is also Adjunct Professor at the University of British Columbia Fisheries Centre and Associate Adjunct Professor in the Department of Geography at the University of Victoria. He is the co-author of the book Marine Conservation Ecology (Earthscan, 2011). Jeff Ardron is an Adviser on Marine Governance for the Commonwealth Secretariat, based in London, UK. He leads the Commonwealth Blue Charter, which was adopted by all 53 Commonwealth countries in 2018. With more than 25 years experience in marine planning and conservation, he has worked in governmental and non-governmental sectors, as well as in research and academia. He has more than 60 peer-reviewed publications and serves on various boards and committees of marine-focussed organisations.